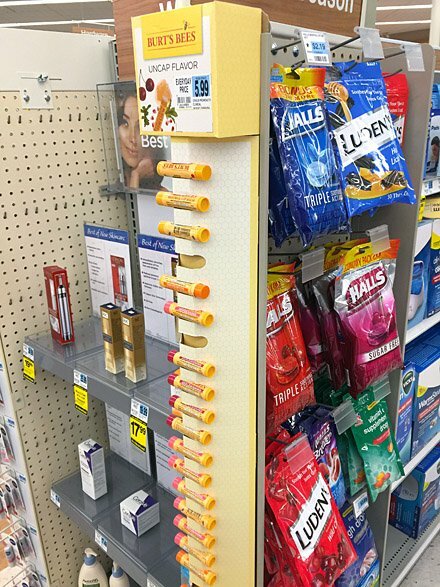 Burt’s Bees® invents another way to merchandise themselves with this Burt’s Bees Linear Corrugated Sidekick as Bandolier outrigger on an Endcap PowerWing. Offered one-up, cap color indicates the flavor formulation. Each is easy to grab and inspect and the entire display is unusual enough to reach out to you. It also turns dead space into selling space for Burt and the retailer. 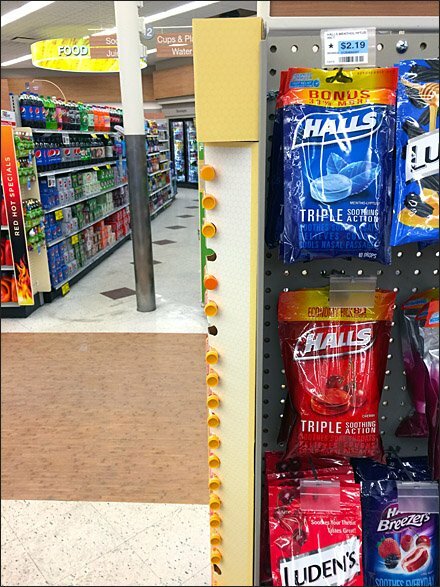 CLICK theough the Burt’s Bees Linear Corrugated Sidekick gallery for various views, If the display were mine I would be driven to rotate each Burt’s Bees tube to face correctly in the lineup, and probably group by cap color and flavor. Obsessive Compulsive Disorder, you know.